On the first launch of the Space Launch System (SLS), America’s next-generation heavy-lift rocket, the Orion Stage Adapter (OSA) will carry 13 CubeSats, or boot box-sized science and technology investigations, that will help pave the way for future human exploration in deep space. Engineers and technicians at NASA’s Marshall Space Flight Center have built the main structure of this hardware that will be part of the rocket when it lifts off from Launch Complex 39B at NASA’s modernized spaceport at Kennedy Space Center in Florida. 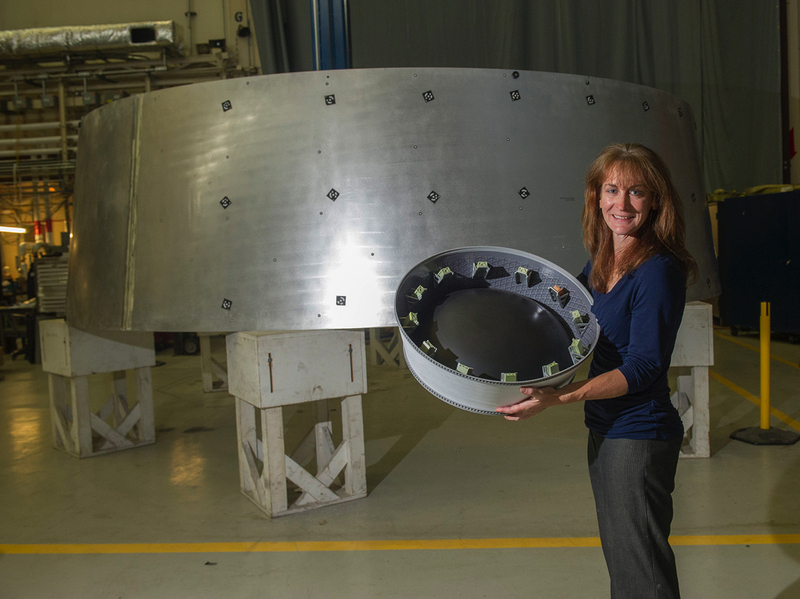 Jennifer Takeshita, the lead for friction stir welding at Teledyne Brown Engineering, compares a model of the Orion Stage Adapter (OSA), including brackets to secure CubeSats during their spaceflight, to the flight hardware nearing completion at Marshall Space Flight Center. The Orion Stage Adapter does exactly what its name indicates: it connects the Orion spacecraft to the second stage of the launch vehicle. Using enormous friction-stir welding machines, engineers just finished welding three large panels into a ring that is 18 feet in diameter and 5 feet high. With this welding complete, it’s time for analysis. The main structural ring is currently undergoing nondestructive analysis using 3-D structured light scanning and photogrammetry, which creates a computer model using photography, to ensure hardware was built to design specification. 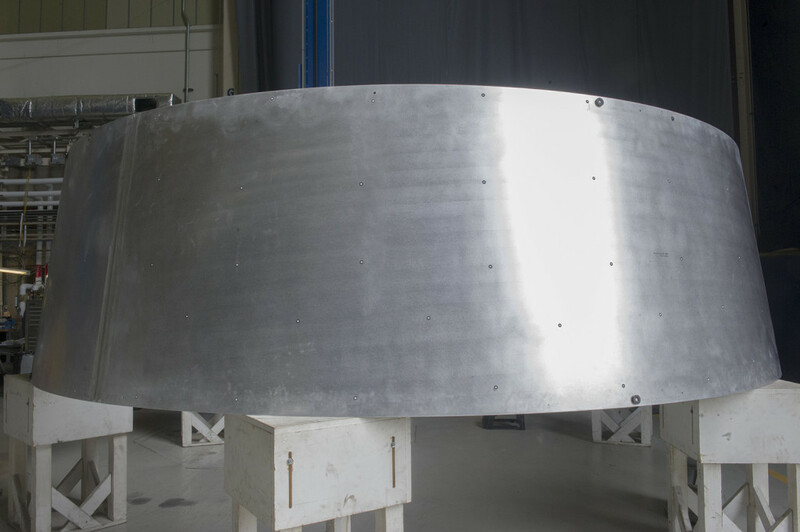 Engineers use 3-D structured light scanning and photogrammetry to analyze the main structure of the Orion Stage Adapter (OSA) at Marshall Space Flight Center. Targets for the optical scanner and SLR camera can be seen on the aluminum structure. Solid modeling software will combine the images into a single computer model so engineers can compare finished hardware to the design. Next, engineers will trim it, weld upper and lower rings onto the large ring, machine it to final dimensions, apply paint, and install the diaphragm, a barrier that separates SLS from Orion. After that, installation of cables and the brackets that will secure the secondary payloads during their spaceflight will complete this critical piece of flight hardware. The 13 CubeSat secondary payloads will be some of the first small satellites to explore deep space and answer critical questions relevant to NASA’s future exploration plans. These small but mighty scientific investigations include ten satellites from U.S. industry, government, and commercial partners as well as the three CubeSats being built by international partners.